Our tuned chau gong sets are hand selected in a factory in Wuhan. 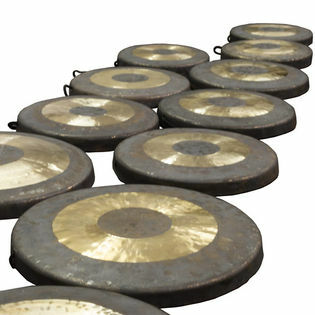 Each set includes a chromatic set of 13 hand tuned chau gongs: C, C#, D, D#, E, F, F#, G, G#, A, A#, B, C in the octave specified. Also referred to as c'–c'' with frequency range of 262 Hz–523 Hz. The largest gong is approximately 9.5 inches and the smallest gong is approximately 7 inches. Also referred to as c''–c''' with frequency range of 523 Hz–1046 Hz. The largest gong is approximately 7 inches and the smallest gong is approximately 5 inches. Excellent gongs for a good price. They are typical bullseye chaus, and they all match aesthetically with a nice even gradation of sizes. The fundamental pitches and intervals are very close - feels like a compromise tuning more than equal-tempered, but I've not found any wolf tones or harsh dissonances in my octave, and even many of the second and third overtones in each gong are well-tuned. Since size and thickness vary, some will crash more easily than others at different dynamics. These are properties of handmade gongs, so I can't complain a bit. I find that getting a pure fundamental tone requires a fairly substantial, but soft mallet - my mallets are made of pairs of Gibraltar cymbal felts slid onto the ends of 5B drumsticks then wrapped with yarn. That will sound them cleanly at pianissimo and allow a dark crash at fortissimo, all without setting them swaying. Anything harder makes them crash too easily for my taste, but even the crashes are made up of well-tuned overtones so that each note is recognizable even playing halfway out from the center. Further out, a rich array of textures and overtones awaits. I knew these would not be as tonally focused as thai gongs in a given octave, but that's what I wanted. I love them, but aspiring concert percussionists and the like may want to talk to SWM instead of blindly ordering like I did. I feel lucky and very happy, but gongs are handmade and it's always best to call or check in person if you need really precise tuning or even registers. I like the personality of what I got, and recommend this set without reservations.